This article outlines how to customise your global record creations menu within the CRM. 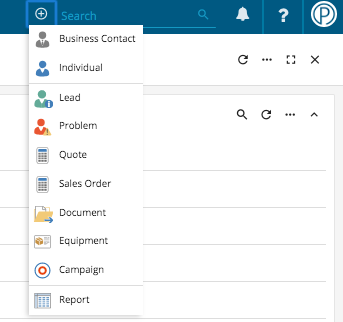 Within the CRM you can create records from the Global Add button located within the application bar. Depending on your business & how you use the CRM, some of these options may not be relevant to your day-to-day tasks. Therefore, you can remove options from this drop-down menu using our configure option. To configure your Global Add Menu you will require Prospect 365 Administrator rights, if you require these then please speak to your key CRM user or our Customer Services Team. To edit your Global Add Menu, click on the settings icon in the bottom left-hand corner. Once within the Settings Centre, navigate to the General section & scroll down until you reach the Record Creation Settings configure option. By selecting the 'Click to Configure' link the Configure UI Entity Creation window will open. To remove an option from the Global Add button find the required option & select No within the Show Globally column. For example you may wish to remove the Quote option as your sales team just use Sales Orders. Once you have completed your edits, refresh your CRM & the items will be removed from the Global Add Menu.